Thomas Woodrow Wilson was born on December 28, 1856, in Staunton, Virginia. 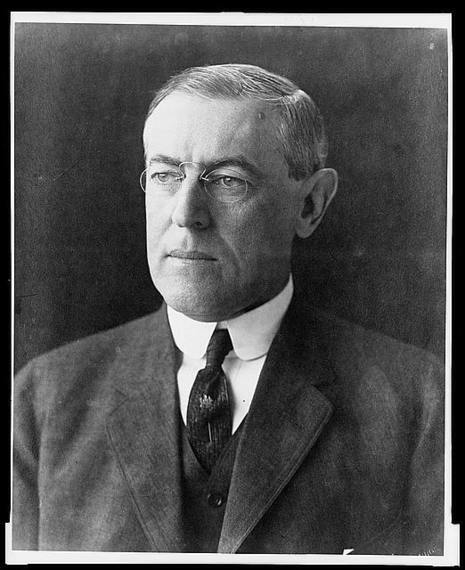 The twenty-eighth president of the United States, Wilson served two consecutive terms in the White House, from 1913 to 1921. Before entering politics, Wilson taught at Bryn Mawr College and Wesleyan University, and later served as president of Princeton University. At Princeton, he earned a national reputation for his political addresses and articles, which contributed to his election as governor of New Jersey in 1910. Two years later, the Democratic National Convention nominated Wilson to run for president. Thomas Woodrow Wilson (December 28, 1856–February 3, 1924) was the 28th President of the United States. A leading intellectual of the Progressive Era, he served as President of Princeton University from 1902 to 1910, and then as the Governor of New Jersey from 1911 to 1913. With Theodore Roosevelt and William Howard Taft dividing the Republican Party vote, Wilson was elected President as a Democrat in 1912. To date he is the only President to serve in a political office in New Jersey before election to the Presidency, although Grover Cleveland is the only President born in the state of New Jersey. Early in his first term, he supported some cabinet appointees in introducing segregation in the federal workplace of several departments, a Democratic Congress to pass major legislation that included the Federal Trade Commission, the Clayton Antitrust Act, the Federal Farm Loan Act, America's first-ever federal progressive income tax in the Revenue Act of 1913 and most notably the Federal Reserve Act.